Also known as "halloween forest"... because, without the lights on, you'll be forgiven for thinking it's a little creepy. 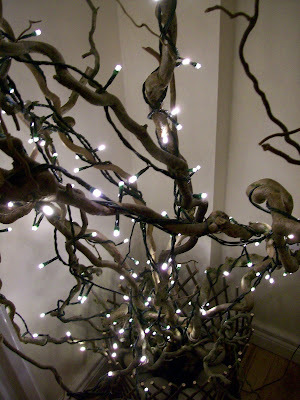 I agree, not many people have gnarled twisted trees beside their dining table! But it really adds such character to the dining experience with all the other lights off....makes you feel like you are having a type of haunted midnight picnic....and we all love those right??....right?? 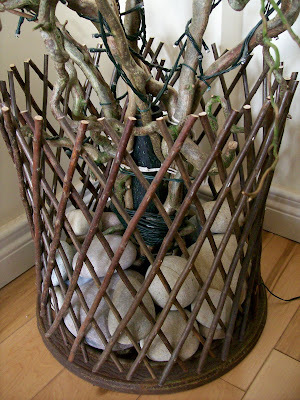 I wanted it to look like it was still growing (without bringing dirty soil into my pristine house, of course) so we built a little twig-enclosure round the base (expandable trellis fencing from the garden centre) and filled it with rocks taken from the decorations at our wedding. ....and that was pretty much it! That is a framed menu from a ristorante and pizzeria in Roma in the background, so I like to pretend that i'm eating on a ivy laced terrace in italy under the stars...mmmm...ok! that's enough sentimentality! 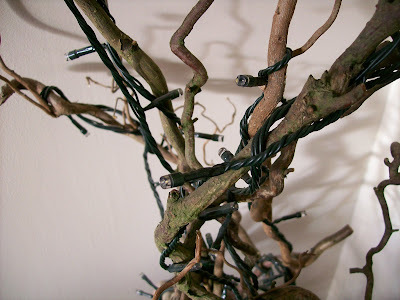 With this, the ivy garland above the table, the ivy stencil on the wall and the grape-vine wine rack my house is starting to look like the site of a invasion....one which the garden is evidently winning! ...but, i've got no problem with that! I had something that I really wanted to say.... but then got sidetracked by talking about picture frames and can't remember. My bad! I'm up for a meal in your pizzeria in Roma any day beside the atmospheric sparkley starlights!